Later that day, as the sun started to set, I pulled out the KitchenAid mixer and put more than five pounds of stuff inside. That stuff included my soaker and all the rest of the ingredients I need to make Five Grain Bread: high-gluten flour, whole wheat, rye, water, two eggs, vegetable oil and salt. I turned it on and it cranked along for five minutes then blew the switch on my professional model. I was short just a minute of the recipe-stated goal. Oh well, I knew this dough was heading for a long ferment. My fridge was just the place. French bakers call this retarding. My five pound, bread-wanna-be went into an 8 litre plastic tub. I waved goodbye to it as I closed the fridge door around 5:30 pm. The recipe called for de-gassing, which my husband, son and dog do all the time. But this was dough. And the recipe called for two (!) de-gassing episodes during an overnight retard. There was no way I was going to wake up in the middle of the night for this effort. So I again, I ad-libbed. I pulled it out of the fridge at 8 and 10pm (ridiculously close in time) and gently deflated it. Goodbye carbon dioxide! And goodnight dough! I left it there in the dark, silent cold of my back room fridge, resting beside a head of cabbage and a bag of dog bones. It just sat there and retarded. Then morning came. At 10am, I took my big, hulking piece of risen dough and plopped it on a lightly floured breadboard. I divvied it up into three, equal-sized pieces and formed the loaves. I’ve never used completely-cold-straight-out-of-the-fridge-dough to form loaves before. They were far less malleable than room-temp dough and when I folded it over and pressed it down, the layers didn’t mesh, they just layered. But I carried forth, feigning know-how, and made three sandwich loaves, cradling each one as I laid it down to rest in the loaf pan. I covered my cold little babies with oiled, plastic wrap. Then the fun began. Every 15 minutes or so, I checked on my loaf-babies like a shy mother, peeking around the doorframe. They puffed up, spread out and once the tops had climbed half an inch over the rim of the pans, I readied them for their voyage into the furnace-hot oven: 460 F.
First I dusted them with a light layer of flour. Then I slashed them with my red-handled, just sharpened, serrated tomato knife. Off they went into the oven, one by one. Quickly, I grabbed hold of my mini spray bottle and gave each a good misting. I waited another minute and sprayed again. The next ten minutes were suspense-packed. I willed myself not to look. Don’t hover! I chided myself. But all the while I kept thinking of my oven-prodigy, wondering how the magic would shape them, fretting if they’d rise right or wrong. The air filled with aroma and everything seemed right in the world. I held off for eleven minutes then finally, I peeked inside: Three domed beauties revealed their glory. I closed the door, set the timer for another 35 minutes and did some more waiting. The loaves were dark and crusty when they emerged from the oven. I have to fight back the family. They have a sixth sense for bread fresh out of the oven and come rushing to the kitchen, drooling. But the Bread Police say “No, no, no!” bread is not ready for tasting just out of the oven. It must wait. If not, warmth and heat will mask the true flavour. So I paced for 30 minutes after shooing off the family. Then I sliced off the heel. The taste was earthy. As I chewed, things crunched. The dominant flavour was strangely… bran! Who would have thunk that? It was the kind of bread you feel virtuous eating. It was likeable, this loaf of Five Grain Bread, but I wouldn’t want to make it a close buddy of mine. But I loved creating this newcomer to my kitchen. I adore making things rise. Some say I’m obsessed. 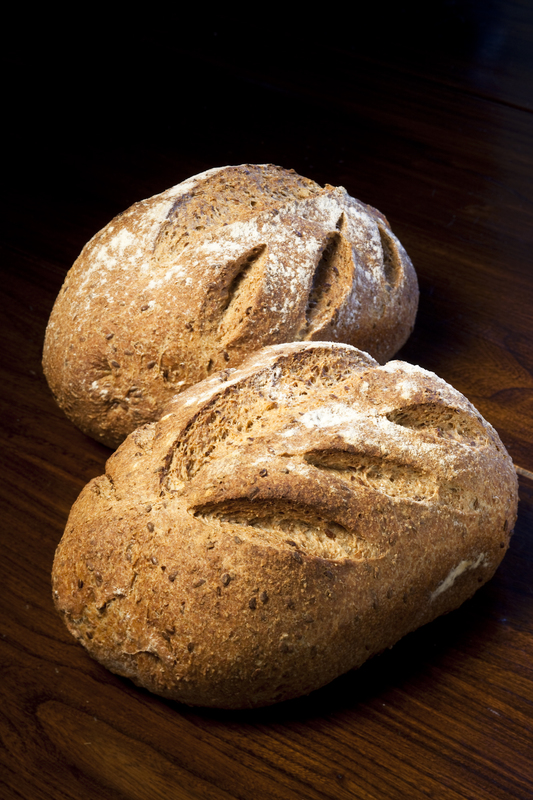 This entry was posted in baking and other miracles, bran, Bread, Whole Wheat and tagged artisanal baking, Coldferment, flaxseeds, Jeffery Hamelman, sandwich loaf, slow food, soaker. Bookmark the permalink. Its lovely reading your stories because I can hear you voice, you are truly a gifted writer who also happens to be a fabulous cook. Madeleine, I’ve read all the stories, bravo. Plain old water was in the mini spray bottle, Shirl. Professional bread ovens have an automatic mister that you can switch on for a few seconds. Some home cooks ditch the mister and put a pan on the oven floor and toss in two ice cubes when they put the loaves in the oven. That creates enough mist for the first 5 minutes of baking. That is the crucial moment when the crust is formed and it needs humidity to do it right!